Because my face is melting in the awesome. That’s right, not three hours ago, our good friend and overlord, Dennis (or Captain Cornflake to the cool kids), finally gave us a brand new forum skin! 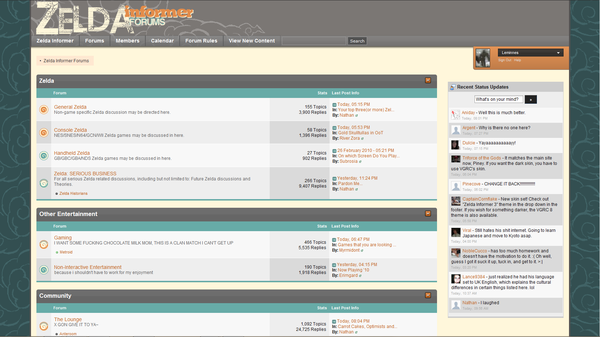 A long time in the waiting, we finally have a forum skin that matches the site layout. Which, if I remember right, hasn’t happened since Zelda Informer 1.0. Unfortunately, this is all the good news I have as comments have still not been fixed much to the chagrin of everyone at Zelda Informer (especially Dennis, who I think is going to pop a cap into his computer.) But with luck, they should be fixed tomorrow. Without luck, we’ll be stuck with forum commenting forever. But I’m sure that will never happen. So, enjoy the new super shiny skin and hope that the comments will be fixed. Godspeed, Dennis. As for the aforementioned forum skin, if you’re missing the old dark blue one, it’s still available. Just scroll down to the footer of the forums, and in the bottom-left corner you’ll find a handy theme selector, which includes the light-blue Zangaroa.com theme and the dark blue VGRC.net theme. The Lightbox plugin has also been upgraded to something a bit more user-friendly. Popup images now scale to size with your browser window, and there’s a cool little slideshow feature built into it, so expect that to show up in the comics section soon. Anyways, I’ve literally been SWAMPED with work the past couple weeks for my web development business, so squeezing in time for ZI’s needs has been tough. So if you were wondering why it took a week to get all this stuff straightened out, well, there you go. Have fun, kids.